With the Wormwood secure after the storm, the ship sailed onward, toward the Slithering Coast. After a few more days of shipboard life and daily duties of drudgery, the waters became shallow as the ship approached a reef. Mister Plugg pulled the Licktoads from their duties, along with Rosie Cusswell. He explained that the Captain fancied crab for dinner. He gave them four crabpots and directed them to the reef ahead. Unfortunately, Rosie could not swim, so she was stuck treading water and trying to spot crabs through the clear water of the reef. Spack Jarrow, Garagornne, Sean Dook Lasard, and Brodo Faggins easily filled two of the pots. As they prepared to embark upon their third dive to capture crabs, two odd creatures shot out of the reef toward them. 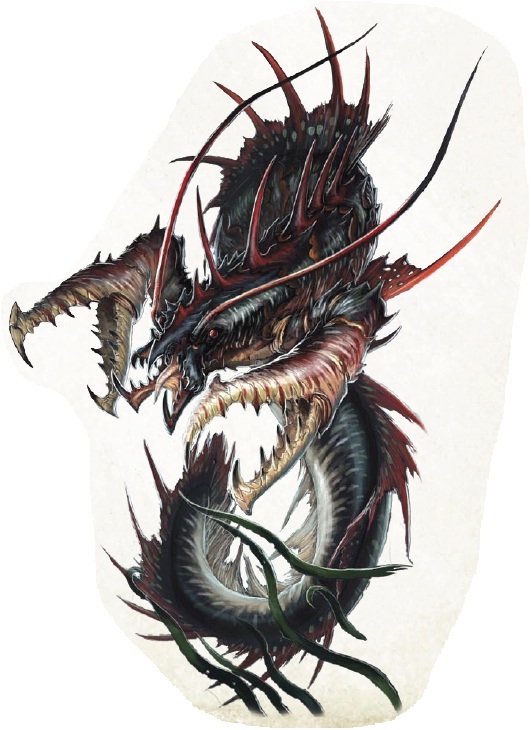 The creatures looked like an aberrant cross between a lobster and an eel and aggressively snapped at the goblins with tooth-filled maws and cruelly barbed claws. With Ent Cleastwood’s help, they defeated the reefclaws. The claws from the crabby beasts filled the other two pots. Despite themselves, the officers were impressed and gifted the Licktoads with a Potion of Cure Moderate Wounds for their troubles, then ordered them back to work. The next day, the Licktoads were relieved of their duties and assigned to boarding training with the Wormwood‘s Gunnery Master, Riaris Krine. She took the Licktoads out into the Wormwood‘s Jolly Boat with a couple of grappling hooks. The Licktoads were instructed to throw the hook to the Wormwood, then shimmy across the rope to the ship, as they would if they were engaged in combat with another vessel. To make things interesting, and in the interests of providing a realistic experience, four crewmembers would throw things to repel the boarders. Several crewmembers were all too eager to throw things at the Licktoad goblins without fear of reprisals. Spack Jarrow and Garagornne quickly shimmied across the rope and back to the Wormwood, avoiding nearly all the debris thrown at them. Sean Dook Lasard took several hits, but made it back on his first try also. Brodo Faggins was not so lucky and lost his grip after being pelted several times, falling into the water. He failed again on his second try and gave up on climbing for his third try, simply using his skill at acrobatics to walk across the rope, dodging the objects thrown by the other sailors. Ent Cleastwood was not so lucky. Between being pelted and having an attack of the clumsies, he failed so frequently that Riaris Krine gave up on him and ordered him back into the Jolly Boat. She took him back to the Wormwood and brought Rosie Cusswell, Sandara Quinn and the rest of the new “recruits” back out for their practice. The Wormwood sailed on. Scuttlebutt was with the new crew now trained, they were looking for prey upon the high seas of Golarion…. Sean Dook Lasard’s player asked for permission to re-build his character to better fit with the group & campaign, so he changed him from a Cleric of Asmodeus to a Storm Druid (I think). A sixth player will be joining the Licktoads soon, another one of the press-ganged goblins coming into his own. This session was a little more action-packed than last session. I ended it a little early because things are starting to ramp up, and I thought if I continued on last night, it would be at least 2 more hours of play instead of another 30 minutes. The Licktoads were awakened by the morning bells and, with the rest of the day crew, ordered to get to work. They went about their assigned duties until around mid-day when Mister Plugg called them together on the main deck. Near him, young Jack Scrimshaw was nursing a nasty leg wound. Mister Plugg ordered the goblins to go do the sort of thing they were brought on board for: go down into the bilge and kill the giant rats that attacked Jack Scrimshaw. Brodo Faggins was eager for the opportunity to acquire more free food and the rest followed. They were joined by another Licktoad Goblin, Sean Dook Lasard. The bilge was tight and partially flooded with foul, brackish water. Half-a-dozen dog-sized, vicious rats swam and moved in to attack once the goblins splashed down into the bilge. They made short work of the dire rats, though a few of them gave Ent Cleastwood some nasty bites. Once all the rats were dead, they scrounged through the filthy water and found several long-forgotten weapons. They were allowed to keep what they found and Mister Plugg was surprised by their success and told them to get back to work once they emerged from the bilge. After the rest of their daily duties were discharged, Brodo Faggins took their bilge booty to bargain with Cut-Throat Grok. Brodo Faggins wished to procure Rosie’s fiddle. To Cut-Throat Grok’s surprise, the locker containing the fiddle (along with all the other items procured from the new deckhands) was empty! The Wormwood officers called all hands on deck while they searched the crews’ duffles. The stolen goods were discovered just where they were planted and the crewmember “responsible” for the theft was hauled before the Captain and thrown into the sweatbox, much to the disappointment of the Licktoad goblins, who hoped he would be keel hauled. The next couple of days were filled with mundane activities. The Wormwood sailed on. One night, Mister Plugg called everyone on deck. Standing there, was Owlbear Hartshorn. Mister Plugg offered 100 gp to the crew member who could beat the Owlbear in an unarmed fight. The crew seemed reluctant to engage, but Spack Jarrow was not deterred. He launched himself at the big human, fighting with tooth and nail. Though Owlbear got in a hit or two and Mister Plugg “helped” the human by tossing him a club, the fight was decidedly one-sided with Spack Jarrow emerging victorious and claiming the 100 gp for himself, along with a healthy dose of respect from most of the rest of the crew. Mister Plugg still hates you, though. More time. More sailing. More ship board duties. The weather took a turn for the worse. Then, a storm. The crew struggled to keep the ship together as the ship was tossed by gale-force winds and waves. One wave washed Sandara Quinn overboard, but she was quickly rescued by a well-aimed rope thrown by Brodo Faggins. When the storm passed, everyone was put back to work repairing the rigging and sails. The Wormwood sailed on, her destination known only to the officers who weren’t talking to the Licktoad goblins. The 3rd Pathfinder game went pretty well. I was surprised how easily a 1st-level monkey goblin cleric was able to beat a 2nd-level human fighting in unarmed combat, though the goblin’s bite attack probably helped a bit, not to mention Spack Jarrow’s player rolled really well and I rolled poorly. There wasn’t much going on in this session, plot-wise though. There’s a total of 21 days on the ship before something major happens. It might seem boring, but I understand why it is like that: the PCs have to have time to form alliances on the ship. Otherwise, they’ll stand alone when the climax of the adventure comes and that would make for a short adventure path.